One of the things I love about art, is that there is always something new to learn and explore. Whether its a new technique, idea or material, the constant state of learning and exploring keeps me interested and excited about what I’m doing. Lately, I’ve been exploring oil paints. I’m particularly interested in the “Alla Prima” technique. In this technique, the aim is to complete an entire painting in one sitting. I am particularly interested in the bold brushwork and improvisational techniques that are a characteristic of this method of painting. I also think it will be a particularly useful method for working outdoors, where weather and light conditions can change rapidly, and you don’t always have a second chance to go back to the site. In order to learn this technique, I’m using the book Daily Painting by Carol Marine as a guide. I love this book. It advises that every day, you sit down to create one small painting. Every day. When you practice something over and over, you can’t help but get better at it. Working small and frequently like this is also freeing, because if you try something new, and it doesn’t work, its not a big deal. You either wipe it off, or toss it, without feeling like you have wasted a lot of time or expensive materials. Since I’ve begun this practice, I’ve seen my skills with oils increase to the point where I’m finally willing to show them to people not related to me. I still make “tossers” but I’m making paintings I am happy with more often than “tossers” these days. Since I’m doing these paintings at least five times a week, I found it was helpful to choose one subject and work with it for the whole week. This makes planning my paintings easier, because I only have to think of a subject once a week. It also challenges me to come up with more interesting compositions so I don’t get bored. I’ve been calling them my “Kitchen Paintings” because I’ve chosen all of my subjects from my refrigerator and/or kitchen cabinets. I have lots of paintings of fruit and vegetables. (I’ve been particularly fond of painting lemons and limes.) 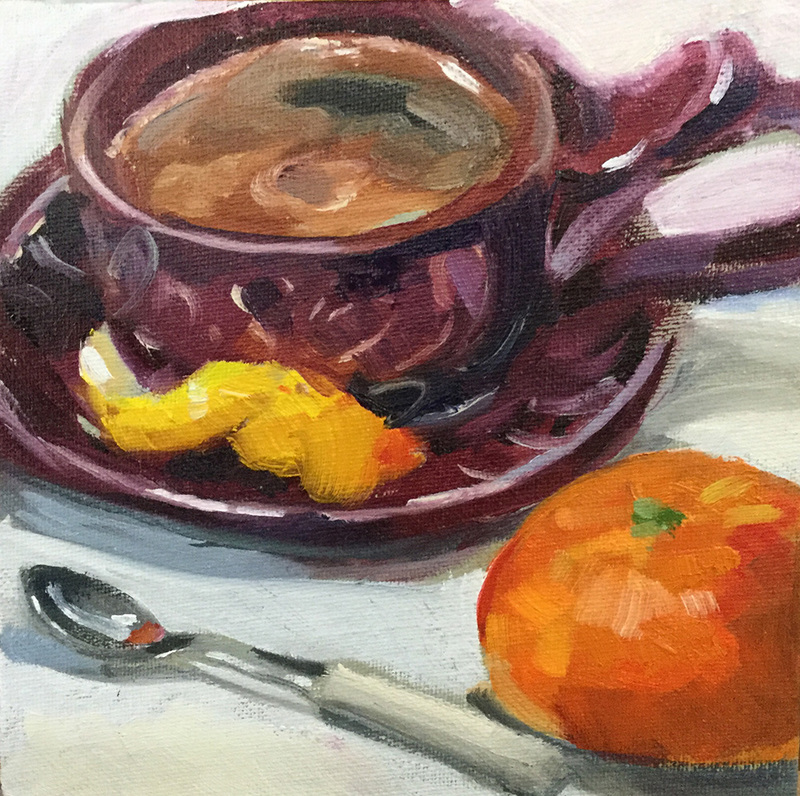 I recently needed a break from the produce, so i did a series of paintings based on my collection of espresso cups. I love espresso. A lot. I also love cute little espresso cups, and have a growing collection of them. Espresso cups are one of my favorite things to bring home from a vacation. They are small and can easily travel home in a suitcase wrapped in clothing to protect them from getting knocked around and chipped. While on vacation, I enjoy spending time in cafes drinking espresso. When I sit down with one of these travel cups at home, i’m instantly transported back to the cafes in the town my cup came from. I also have family members who are potters ( Batton Clayworks) and have a few espresso cups made by them that I am particularly fond of. I am enjoying the immediacy of the Alla Prima technique, because it suits my short attention span, but one thing that is hard for me is the length of time it takes oil paint to dry. I tend to apply my paint thickly, and it is taking FOREVER for these paintings to dry. But they say patience is a virtue, and I could use some practice in that area anyway, so I will wait. But I won’t promise not to grumble about it. When these paintings are FINALLY dry, they will get varnished and will be available in my webshop, so keep an eye out for them.